SSC Scholarship Result 2018! Secondary School Certificate(in shot SSC) exam result will be published on May 6, 2018. 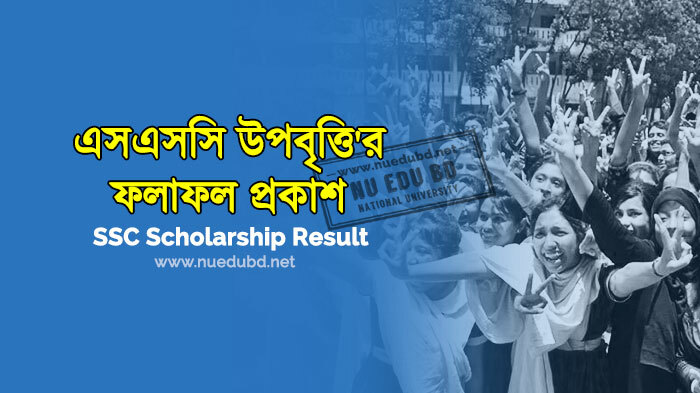 All the education board of Bangladesh will publish the result on their official website. After publishing this result, you can check your SSC Result 2018 from the Official Website of “Bangladesh Education Board”. Today we will share with you all the information of SSC Scholarship 2018. By following this article you will be learned about your Secondary School Certificate SSC scholarship result 2018 and full details about it. So let’s start. There are about Ten Education Board in Bangladesh and these are (Dhaka Board, Chittagong Board, Sylhet Board, Rajshahi Board, Comilla Board, Barisal Board, Jessore Board, Dinajpur Board, Madrasa Board & Technical Board). Every year a lot of students are attending in SSC examination. In this year all the SSC examine are waiting for their desired SSC Scholarship Result 2018. After publishing the SSC result, you will get your Scholarship result from your Education Board's website. In here I am sharing full details about your SSC scholarship 2018. Even you can check your result from our website. We are providing all kinds of Education Results, Notices, Routines and update. When SSC Scholarship Result 2018 will Published? It is the most common question for all the students. Usually, all the Public examination result of Bangladesh Education Boards are published within 60 Days. If you make a remarkable result in the Secondary School Certificate Examination 2018, you can keep your in the SSC Scholarship Result 2018 on your education board. Because of every year, a large number of students are getting Scholarship from their Board for a Good Result. The Education Ministry of Bangladesh is giving this Scholarship for some criteria. We are now briefing about this topics. Students must be a citizen of Bangladesh. The scholarship is depending on their Higher Education process. Only the selected students will get the Stipend for the good results. You know that every year Bangladesh getting a lot of amount for developing their education system. United Nation, UNDP, USAID, UNESCO and other large organization are giving fund to Bangladesh for helping the students of Bangladesh. If you get the Scholarship for your SSC result, you will get better opportunities for higher education. Students will get a different amount for different categories. Talentpool Grade- Students will get 600/- Taka per month. General Grade- Students will get 300/- taka per month. You will get the amount for Two (2) years in your college life or other education purposes. The SSC Scholarship result will be published on the Last month of this year. Student’s can get their result from their own education board. If you don’t know How to get SSC Scholarship Result 2018. don’t worry we are here for you. Please check in below for all Education Board SSC Scholarship Result 2018. After publishing the Scholarship result, we will update the download link for this result. You can easily find your result from our website by downloading the file. I hope you got helped by found this article for your SSC Scholarship 2018. We always publish educational information for all Bangladeshi students. Once the SSC Scholarship result got published, then you check your desired result here. If you feel any problem to get your SSC Scholarship result 2018, please give a comment in our post. We will try to solve this as soon as possible. Hope you will be helpful by reading this article. Visit our website regularly for more updates and information.